How often do you eat an entire bag of those greasy potato chips and feel a tad guilty afterward? I love salty chips. I could eat an entire bag in one sitting. Is that good for me? No way. 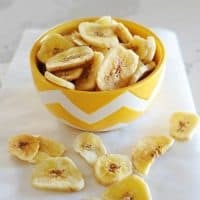 So I’m always looking for healthier options to curb my cravings. Just like MOMables is always looking for healthier ways to help you pack lunch fast and fresh! 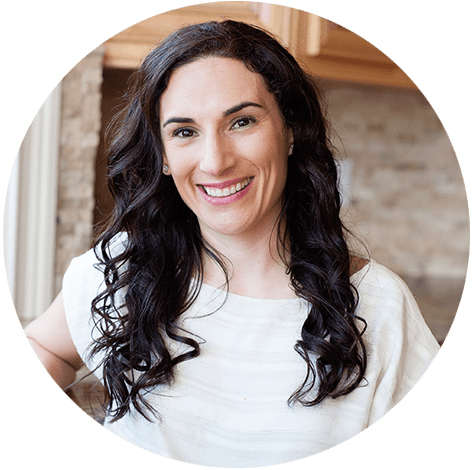 With the meal plan, you get a shopping list, a step-by-step recipe for each day of the week and even pictures to give you an idea of what the end result should look like! 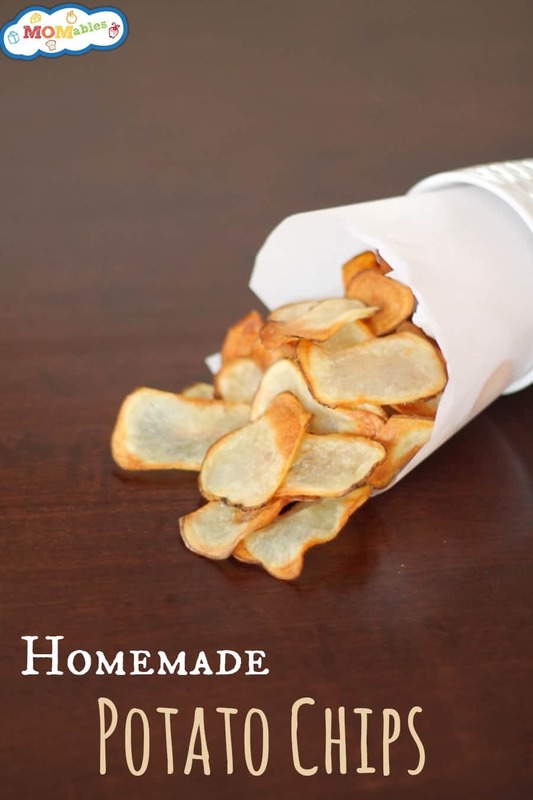 Making homemade potato chips is so simple, and it’s a delicious way to help fight those “snack attacks.” All you need are three ingredients! Try them with one of our delicious dip recipes to add some extra zing! Like our Creamy Avocado Dip, Creamy Herb Radish Dip, or even our Homemade Ketchup recipe. Make sure you’re using a mandoline or the slicer on your food processor if it’s adjustable, set to the thinnest setting. You want a consistent slice thickness. After slicing, make sure you pat the slices dry with paper towels to help remove any excess moisture. This is also crucial to them baking correctly and evenly. Using a mandoline or slicer, THINLY slice the potato. Coat the parchment-covered baking sheet with the cooking spray. 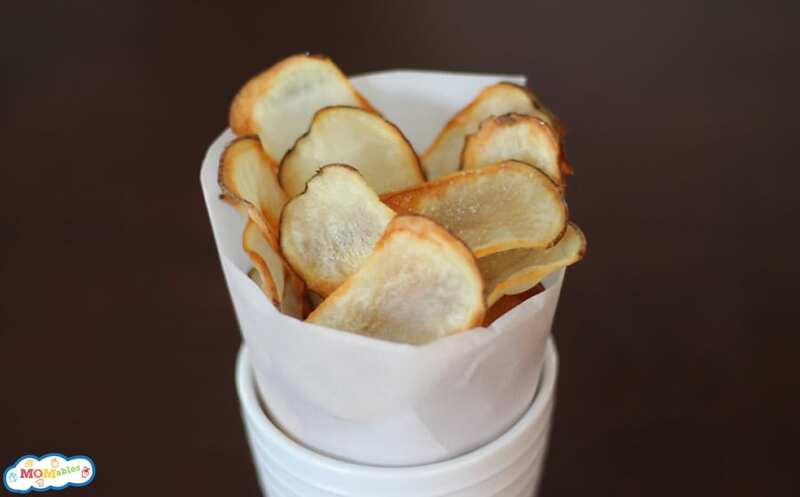 Evenly spread out the potato slices in a single layer, then spray the tops as well. Bake them for 18 to 20 minutes, until they begin to turn golden brown. Flip the slices about 11 to 12 minutes in. Once you get close to 18 minutes, keep an eye on them because they will brown and crisp up QUICKLY. Some slices may cook faster than others. Remove those slices, if that happens to a few. Once they reach your liking, remove the baking sheet from the oven and evenly sprinkle with the sea salt. I’m a blind young woman who absolutely loooooves potato chips! I’m trying my best to rid my diet of those pesky preservatives, and switch to making my favorite foods from scratch. I wonder, is there a slicer that is considered safe for someone blind like me? I’m one of those girlies who is a bit frightened of knives, and my mom says that a slicer can be dangerous if you can’t see. I’ve also soaked them in vinager and salt overnight and if you like vinager and salt potato chips these are pretty close. What is the exact measurements you use this sounds delicious! 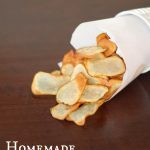 If you soak the potato slices in salt water overnight, it draws out much of the moisture and infuses them with a salty flavor. They will be much crisper. Still dry th off with paper towels before baking. Blake and I will be making these soon. The kid LOVES chips. So do I actually, but he could live off of them. Love how simple this is too!